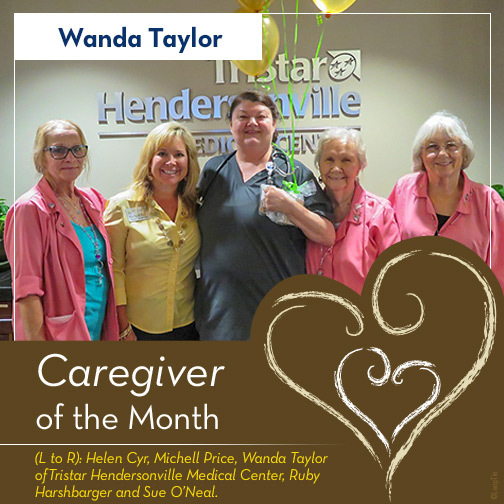 It is easy to see why Family Legacy was able to proudly award Caregiver of the Month to Wanda Taylor of TriStar Hendersonville Medical Center. Read the story below submitted by a family who was truly touched by her compassion. Wanda was not only a true professional but a wonderful person to the core. Her compassion for her fellow human by far surpasses any title on her badge. When our loved one became critical she was on the spot not only with a solution but with compassion and care for him and his wife. Wanda went above and beyond to care for the family as well through either food, details on procedures and even a gentle shoulder to cry on. When our loved one passed she came to the visitation and comforted the family. Wanda is not only a nurse but a true gift of the Lord.